Do Not Copy photo's without permission! Easy and safe payments via Email!! If you're not up on X-10 you should be. NJBMX Webring: Your Gateway to BMX Information on the Net. 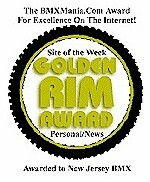 Want to add your site to the NJBMX WEBRING? This Web Site is Managed by Visions InfoLine . Contact Visions InfoLine for WEB Page Design & Creation Services.